Duck Balls. Pig Trotters. Beef Tongue Pastrami. These aren’t secret ingredients for a Chopped battle, but they should be. Chef/owner Nelson Perkins, a Colorado native* and former stockbroker, has some crazy things on his Colt & Gray menu, so if you’re looking for something different, this is your spot. And even if you’re not feeling adventurous, they've got something for you. And by something, we mean a duck leg stuffed with foie gras. Opened in the fall of 2009, Colt & Gray is tucked away near the Highland Bridge, in an area that we don't really know what to call. Some dude from California told us once that it's called Commons Park (which he probably heard from his realtor), and we are absolutely not going to call it that. It’s an isolated area, but with Sushi Sasa and Denver Beer Co. nearby, it’s got some good things going for it. 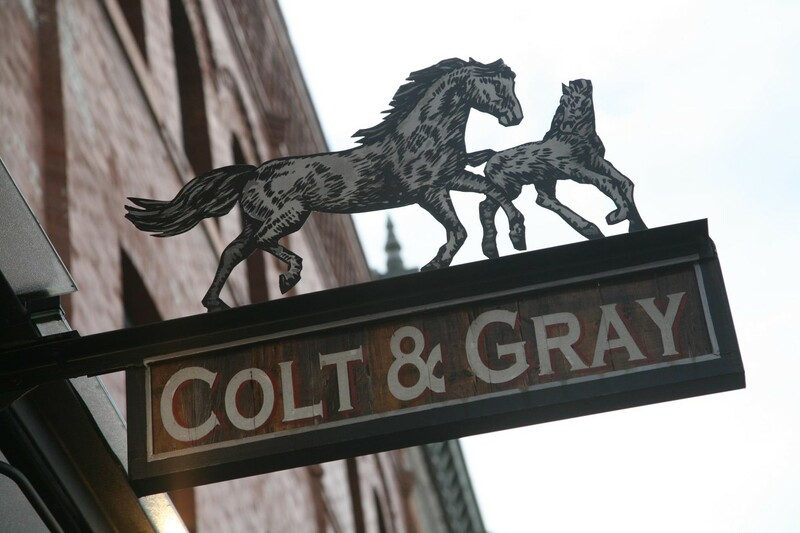 One of the things we love most about Colt & Gray is that you can pick your speed. If you want to go simply and chill at the bar with some bacon caramel corn and a stiff drink, go for it. Or, if you’re on a date and want to try sautéed sweetbreads and monkfish or roasted marrow bones, the dining room is a perfect spot – and god bless you for finding someone that will actually eat that sh*t with you. And if you’re rolling with your crew and want to track down some Action At The Bar, head to the downstairs hang called St. Ellie and get after it. Speaking of "your crew," whenever we mention Colt & Gray to friends, it’s often at the top of their never-been-there-but-I’ve-heard-good-things list. Time to change that. The meat and cheese choices are always changing and are always good. The duck liver mousse, should you find it available, is super rich and aggressive in flavor, which may not be for everybody. But it is also awesome. A small plate, but the flavor is enormous. Clams, octopus, fava beans and spicy nduja sausage come served in a mini dutch oven, just ready for you to get to. Ask for extra ciabatta and get down. Fancy... we got a bite of green apple sorbet before our entrees. Sure, why not. We found out later this is called an intermezzo, but don’t ever say that, just like you shouldn’t ever call yourself a foodie. The duck was rich, fatty and damn tasty, with perfectly crispy skin and a lavender and citrus glaze that was crazy good. The lentils with roasted garlic and almonds were excellent too. You can’t go wrong with anything duck on this menu. Moist, flaky sea bass with crackly crisp skin. The crunchy lentils and baby turnips added some nice texture too. Fish is always a solid choice here if you’re not feeling turf or any part of an animal’s head. This is not light and may feel like overkill after a big meal, but c’mon, it’s worth it. Dense sponge cake drizzled with toffee sauce and topped with bourbon (!) ice cream. Yup. We’ll issue an unofficial challenge. Try to eat this while sitting by Colt & Gray’s fireplace without passing out. Even if you win, you lose. Order it.